Erica recently moved to Golden, CO to start working on her PhD in environmental engineering at Colorado School of Mines. She is working towards alleviating water stress around the world through her research in advanced water treatment techniques. She has held prestigious internships at Intel, and Lawrence Livermore National Labs throughout her rise into the professional ranks of endurance sports. Erica started training for triathlon in 2012, and after finding success there, made the switch to road in late 2016. 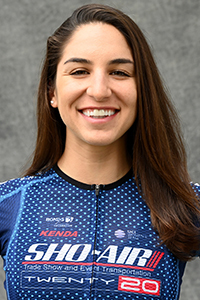 A successful Tour of the Gila and a win at collegiate road nationals propelled Erica to the next level and she rode the rest of the 2017 season with Visit Dallas DNA before joining Twenty20 Pro Cycling in 2018. While Erica has personal goals in the sport, ultimately, she would like to be a part of a greater change in cycling culture to make it more inclusive. Erica believes that this ties in well with her engineering goals because with more people out riding bikes, roads can be made safer for cyclists and this can help alleviate many of the environmental and socioeconomic problems that are associated with cars-air pollution, traffic, obesity, etc. Growing up I’d always wanted to play a team sport. The strategy and team dynamics involved in bike racing drew me in from triathlon. I love seeing anyone work hard and achieve their goals. I think often about my grandma who came to the U.S. with a 2nd grade education; unable to read (in any language) or speak English. She worked as a seamstress and sent money back to her family in Mexico, eventually saving up enough to buy her own sewing machine. From there she eventually she started her own business that is still around today and she reads the bible daily. Getting to connect with so many awesome people that I would never have met otherwise. Female pro cyclists and the people out supporting women’s pro cycling are absolutely rad! Winning the road race at collegiate cycling nationals was a pretty cool experience. I had some great competition and I was proud of my result given that I was finishing my engineering degree simultaneously. Adelaide, Australia. I kicked off the 2018 season with the Santos Women’s tour; my first race on Twenty20 Pro Cycling. Not only was it an excellently organized event in an amazing location but it was meaningful to share the experience with my new teammates who are now close friends! Favorite cross training or off-season activity? Just get out there and ride. Cultivate a love for the sport in yourself and in others. What are one or two things that you do daily that are the key to your success? I try to listen to my body. If I can’t focus on school and need to go for a ride-I do it. If I can’t focus on my ride because my mind is on school I might scrap the workout for that day. If I’m hungry I eat and if I’m tired I try to rest. Athletically I’d want to be a triathlete again or maybe an endurance mountain biker. Career-wise I would be exactly where I am now-working on my PhD in environmental engineering/trying to directly impact important problems in the world. If you could spend 10 days anywhere, where would it be? I went Alaska with my family this year and got a brief tour of Denali National Park. I’d really love to have a real adventure there! A few years ago, when I was still a triathlete, I was following the Tour of California and watched as a relatively unknown Latvian guy took an unexpected win and the GC in the 4th stage. Being from California, I planned a visit on the day that the guys finished on Mt. Baldy and rode up ahead of them to watch with my Dad and his team. This guy, Toms Skujins, wasn’t expected to be able to hold onto the GC against all the big teams but it was still exciting, and my boyfriend and I cheered him on as he climbed. He said “thanks guys” as he passed, and we thought that was super cool.